Last week, the Senate Environment and Public Works Committee passed its transportation bill. The bill is a blueprint for spending $265 billion on surface transportation over six years. It doesn’t include transit or rail provisions yet, and no funding source has been found for it. 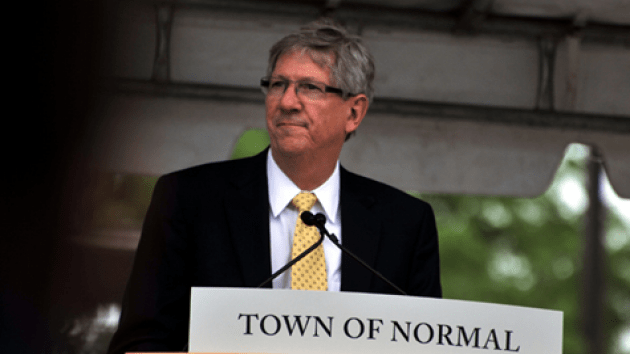 Streetsblog wanted to hear from a local official about how this bill would affect their community, so we spoke to Mayor Chris Koos of Normal, Illinois. Koos, who owns a bike shop in town, has served 11 years as mayor and is a member of Transportation for America’s advisory board. 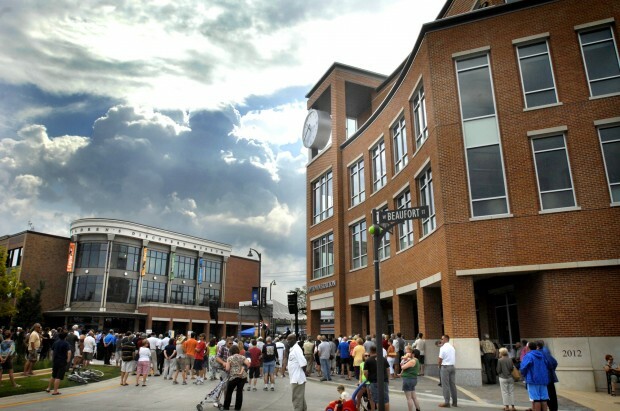 As mayor, Koos has presided over big changes in Normal, including a revitalization plan that made Uptown Normal more walkable and anchored it around an Amtrak station. I saw your panel here in DC in February, where you talked about the Uptown Normal Revitalization plan. And you said it couldn’t have been done without a strong federal partner. When you look at the bill that just passed the EPW committee, does that give you the strong federal partner you’re looking for? I think it adds some things. We’re a community that’s too small to really take advantage of any TIFIA programs. And I don’t think it was in the bill, but anything that would give greater local input and control in terms of transportation dollars would be great. In terms of TIFIA or in general? You said Normal isn’t big enough to take advantage of TIFIA, but you have taken good advantage of TIGER. TIGER turns into Projects of National and Regional Significance in this bill, but the projects have to be $350 million or more. Remind me: How much was your revitalization project? Well, the federal dollars we got — we got $22 million in a TIGER I grant, and we got about $7 million more in annual approps. But what was the full project cost? For Uptown Station? About $42 million. Is there anything you can even imagine in your community that would meet the $350 million threshold? No. The only thing I could see is a regional project. You know, when you get to dollars like that you’re pointing at highway or fixed-rail systems. I don’t even see that kind of money going to airports unless you’re O’Hare or LaGuardia or something like that. Would that be a big loss, to see TIGER turned into something that had that such a high threshold? Yes, I absolutely think so. If you look at the projects that have been funded over the past — what are we in, TIGER V now? If you look at those projects, none of those projects would have qualified on that threshold as far as I can see. Most of the projects were smaller. The projects I’m aware of in Illinois and Michigan had to do with multimodal stations and rail upgrades — nothing anywhere near that threshold. A lot of smaller communities would not be able to benefit. You helped unveil The Innovation in Surface Transportation Act with Rodney Davis recently. [The bill would allow local governments to access more federal transportation funds.] Is that the sort of thing you would be looking for in this bill to give more local control? Yeah, that’s a big issue for us. Saying that, I don’t have anything in the near term where I would take advantage of those programs, although we are looking at a bus connection between Peoria and Normal to access passenger rail. We’re doing it by bus initially to prove the ridership that everyone thinks is there so that we could go to a more robust, maybe even a fixed-rail connection. No one wants to spend dollars on fixed-rail connections until we know ridership is proven. [We want to make it] seamless with Amtrak. In other words, a customer could go to an Amtrak station or go online and buy that bus connection and buy their ticket. It would all be seamless. Is there anything else for local control that could have been in this bill that wasn’t? They did increase the TAP [Transportation Alternatives] program amount. Well, the way TAP’s been handled the last couple of years, that’s a small win I guess. And a longer-term bill. There’s some stability that comes out of that, so that’s a positive. Can you tell me a little more about how important Transportation Alternatives — bike and pedestrian funding — is to Normal, and how helpful is it to have that some of that funding under your control as mayor and less under the control of the state of Illinois? Yes, we have a pretty robust trail system in our community. With the two pieces we approved just recently, we’ll be up to about 37 miles of trail in the Normal/Bloomington community. All off-road trails or bike lanes on streets? All off-road. The way the trail is configured we have pretty good north-south connectivity through our community but we don’t have good east-west connectivity, and were adding bike lanes and sharrows. And we significantly increased the amount of bike parking that was available in the Uptown area. We find that as we add these infrastructure improvements, the ridership and use just follows right along. Giving people safe routes to commute on, it makes them want to do it more. Is that something you were able to do specifically once that TAP money was in local hands? Now that the TAP money goes straight to local communities in a different way than it used to, how has that changed the way things are done? It hasn’t for us yet; we haven’t taken advantage of that. Any dollars that we’ve gotten for alternative transportation have come through IDOT. And we could do a lot more. We have a strong tourism-based program that we’re struggling with because we can’t get it funded. It’s the Route 66 trail system that would ultimately go through the whole state. But we have a section from Chenoa, Illinois, which is about 20 miles to the north of us, to Atlanta, Illinois, which is about 20 miles to the south of us. We’ve done one phase of a four-phase project, but now we’re just sort of stalled because of funding. Overall funding levels haven’t gone up appreciably since SAFETEA-LU. Is it enough for Normal to do what it needs to do? Or are there projects that don’t get done from year to year because the federal funding is still so constricted? Yes, there are projects that don’t get done. And it has to do with the funding at the federal level, but it also has to do with state matches that Illinois is unable to make. So it’s a double-edged sword for us. What kind of funding source would you advocate for? That’s obviously the unfinished business of this bill. Realistically, I think it’s going to take a portfolio of funding devices. Not any one funding recommendation really solves the problem. I’m a big fan of VMT, but VMT has a lot of unintended consequences as well. I was talking with someone from Chapel Hill yesterday who said, ‘VMT would actually hurt us because we have such a robust transit system.’ Their vehicle use has dropped significantly in that community and so in a scenario like that, they’d actually get less funding. But they have the same issue with the gas tax. Absolutely. I can’t say as I can point to anything other than the fact that it needs to have a significant and stable funding source going forward. It’s up to the Congress to figure that one out. What about tolling? The president put expanded permission for tolling interstates his bill. Is that something you think would be useful? I think so. It’s a use tax. So I think it makes sense. $22 million in FEDERAL funding for a town of 52,837. 52k in permanent residents, but over 25k in college students enrolled at Illinois State (20k), Heartland (5k), and Lincoln (600). Also, another 76k live in Normal’s twin city, Bloomington, which is also home headquarters to State Farm and Country Financial and about 3k of students enrolled at Illinois Wesleyan. So, total students & permanent residents served by Normal’s Fed-supported transit-oriented redevelopment: 103,000, or about twice the number you cited. Full-disclosure, I am an alumni of ISU. $416 per resident. That’s ~$41 per resident per year. TIGER (just one program) over the 4 years in Wikipedia has paid ~$3,111,000,000 or about $25 per US resident per 10 years. Plus it’s a college town. For a major (once in a decade scale) capital program that doesn’t seem especially out of proportion to the population. I’d prefer it wasn’t the Federal government doing it but that’s really just ideological.